Situated in the northeastern part of the United States, New York was one of the first 13 colonies and is now the 4th biggest state in terms of population and 27th largest in terms of physical size. New York is often referred to as 'New York State' due to the global importance and significance of New York City, which is the biggest city in the state. The state of New York has borders with Rhode Island, Connecticut, New Jersey, Pennsylvania, Vermont, and Massachusetts, along with an international border with Canada to the north. Various landscapes make up the state of New York, including the famous Hudson River Valley, Atlantic Coastal Plain, Adirondack Mountains, and Appalachian Mountains. The state also borders two of the five Great Lakes of North America: Lake Ontario and Lake Erie. The capital city of New York is Albany, but the state is best known as the home of NYC. Here are some important details, statistics, and overviews of the largest cities in New York. A city that needs no introduction, New York City, also known as the Big Apple, NYC, and 'The City That Never Sleeps', is one of the most famous urban locations on the planet. It's by far the biggest city in New York State and is also the biggest and most populous city in all of America. 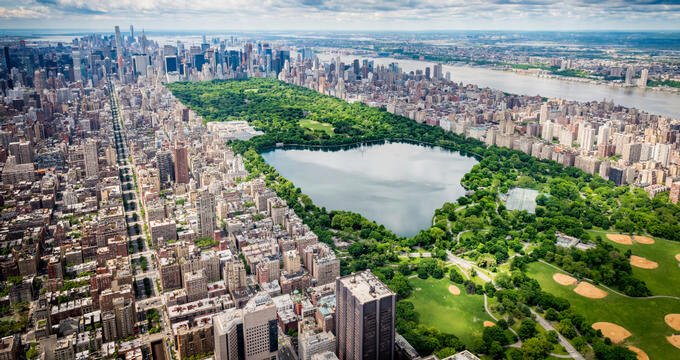 New York City covers an area of 468.484 square miles, encompassing multiple counties and boroughs including the Bronx, Brooklyn, Manhattan, and Queens. The city has an estimated population of 8.6 million, with over 20 million living in the surrounding metropolitan area. NYC has featured in dozens of films and TV shows and is one of the most popular tourist destinations on Earth, renowned for its countless skyscrapers and landmarks like Times Square, the Brooklyn Bridge, and the Statue of Liberty. Situated in Erie County and part of the Buffalo-Niagara Falls metropolitan area, Buffalo is the second biggest city in the state of New York. It is located in the western part of the state and regarded as a key transport hub for travelers crossing over the Canada-United States border, as well as being a great spot for tourists to visit Niagara Falls. Buffalo covers an area of 52.5 square miles and has an estimated population of 258,000, with over 1.1 million in the surrounding metropolitan area. The city was named after the nearby Buffalo Creek and is also situated in close proximity to Lake Erie. Buffalo is notable for its urban planning layout and annual festivals. Situated in Monroe County on the shores of Lake Ontario, Rochester is the third biggest city in New York State. The city is located in the western part of New York and covers an area of 37.14 square miles. It has an estimated population of 208,000, with over 1 million people in the surrounding metropolitan area. Rochester was named after Colonel Nathaniel Rochester, a soldier in the American Revolutionary War. The city is known for providing a high standard of life to its residents and has a strong economy, being the founding location of several major brands and businesses. Located in Westchester County in the southern part of the state, Yonkers is the fourth largest city in New York State. It covers an area of 20.3 square miles and has an estimated population of 200,000 people. The city's name derives from a Dutch word 'Jonker', meaning 'young man'. Yonkers is also known under the nickname 'City of Seven Hills' due to the numerous hills located around the city. Yonkers is a key commercial and tourism spot for New York State, home to several attractions like the Hudson River Museum and Getty Square. Located in Onondaga County, of which it is the county seat, Syracuse is the fifth biggest city in New York State. Syracuse can be found in the central part of New York, thereby earning the nickname 'Heart of New York', and covers an area of 25.61 square miles. The city has an estimated population of 143,000 people, with over 660,000 in the surrounding metropolitan area. Syracuse was named after a town of the same name in Sicily. The city is home to Syracuse University and the very busy Syracuse Hancock International Airport, which is the largest airport in the region.